A powerful blender designed to tackle whatever you throw at it. The multiple speeds and settings make blending an easy task, at an affordable price to get you the most out of your money. This blender gives you the performance of a top-of-the-line, industrial blender in the comfort of your own home and comes with a 7 year warranty. Versa 1,400 Watt Variable Speed High Performance Blender (Black) A powerful blender designed to tackle whatever you throw at it. The multiple speeds and settings make blending an easy task, at an affordable price to get you the most out of your money. This blender gives you the performance of a top-of-the-line, industrial blender in the comfort of your own home and comes with a 7 year warranty. 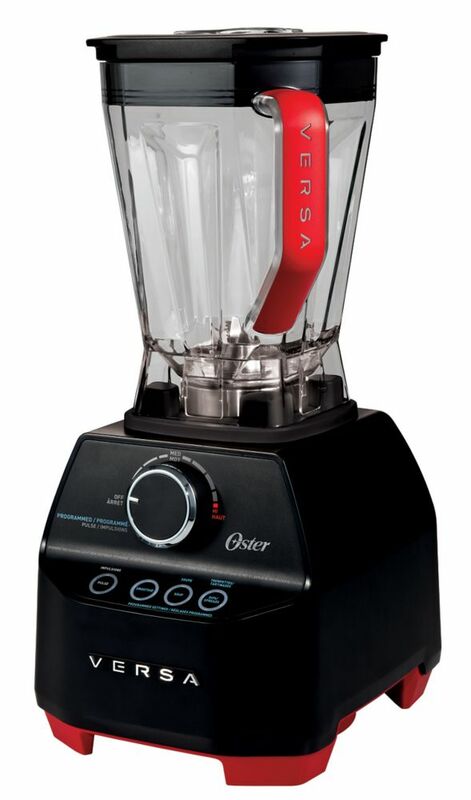 Versa 1,400 Watt Variable Speed High Performance Blender (Black) is rated 3.0 out of 5 by 8. Rated 1 out of 5 by Milos Ott from Bad support! This product has a warranty of 7 years. Jar is leaking after 2 yearw but this part is not under warranty. At this moment the new jar is not available. I am unable to use my blender. Rated 2 out of 5 by Tash from Disappointing Does not blend well at all. My frozen fruits in my smoothies still not blended after using the smoothie setting twice. Jug now cracked so I have leaks machine not even a year old. Huge waste of money. Rated 3 out of 5 by veg1 from Program settings We have only used the 1400 a few times and recently we tried the program setting for soup. When we turn the dial to program settings, and press the soup button, the blades spin only briefly and stop. Also, when dial is turned to the program settings only the pulse button is illuminated. Should all the program buttons illuminate? It seems only the pulse works and none of the programmed settings work. Rated 2 out of 5 by gbkn from Good value, but jar is subpar quality Good value and performs well in most settings (smoothie, almond milk, etc), however jar developed a hairline crack at the bottom near the blade. As a result, liquid is leaking out. I am hoping the 7 year warranty will cover this. I also bought my parents this blender and the rotor at the bottom of the jar is starting to rust. Had high hopes with this blender, but am now disappointed. I think the jars need to be improved to make this a worthwhile product. Rated 5 out of 5 by hayes from Great mix of power and budget We've had this blender for over a year and love it. Try not to use it on high for longer than necessary because the metal components get hot. Friction happens. Rated 2 out of 5 by Tekchik79 from Good power but needs revamping I wanted a Vitamix but couldn't afford it so I went with this one. While it has a good amount of power, that's almost its downfall. It's so powerful and the base is so wide that it basically just knocks food around instead of blending it. My smoothies constantly have lumps in them whereas in the Vitamix I've had the opportunity to use, they are all perfectly smooth. And sadly, if I ever just want to blend up a small amount of something, I know that it won't work in this blender as there's no real low speed setting. As soon as you turn it on it just knocks everything to the side or the top of the container. So I had to spend more money and buy a smaller blender. Should have just spent it all on a vitamix! However, if you have the right amount of solid to liquid ratio, this works well at blending. Hope they come out with a smaller jar!